ROLEX REF 16600 SEA-DWELLER, CUSTOM PVD CASE Fine, center seconds, self-winding, water-resistant, stainless steel diver's wristwatch with date. Custom PVD case. Bracelet Stainless steel Rolex Oyster Fliplock bracelet Ref. 93160, 175 mm. Signature Dial, case and movement. 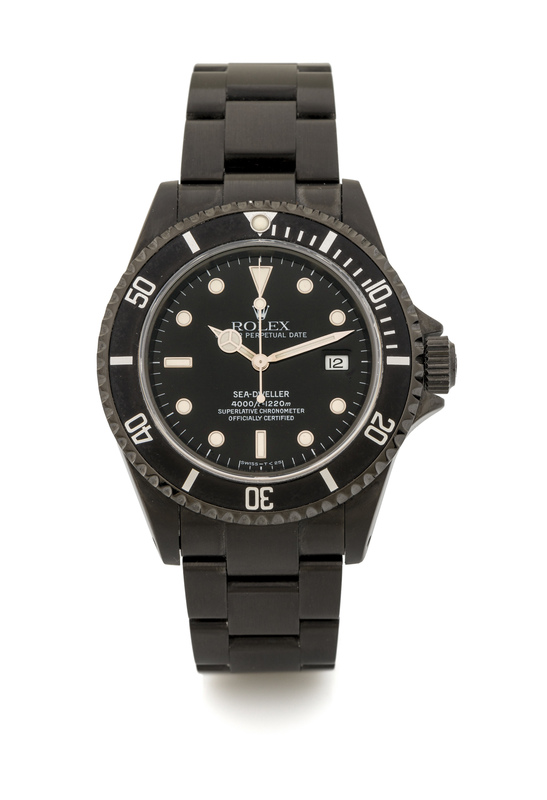 Aftermarket additions void the manufacturer's warranty and ROLEX will not warranty and/ or service the present watch. Aftermarket additions are NOT official products of Rolex and have not been endorsed nor licensed by Rolex. Cosmograph Daytona, Milgauss, Oyster, Rolex and the Rolex coronet are all registered trademarks of the Rolex Corporation.